Resource center A Look at Drug Abuse. Common Signs and Symptoms What Is a Prescription Monitoring Program? Abuse of prescription medications is a major issue in the United States. The National Institute on Drug Abuse (NIDA) reports that prescription medication abuse is one of the leading causes of substance use disorders in the US. The prescription medications that are most commonly abused include central nervous system depressants like benzodiazepines and narcotic pain medications. These medications can be extremely dangerous when they are not used according to their prescribed purposes. The estimated cost of prescription drug abuse runs into the billions of dollars. Federal and state governments have implemented numerous controls in an attempt to deal with prescription drug abuse. Many of these controls use prevention programs and psycho-educational techniques to stop substance abuse before it starts. One such approach is the implementation of prescription monitoring programs. Prescription monitoring programs (PMPs), sometimes also referred to as prescription drug monitoring programs (PDMPs), are operated by each state. They collect and disseminate data regarding the prescriptions and dispersions of controlled substances as well as other potentially abusive prescription medications/drugs. PMPs attempt to cut down on issues with prescription drug abuse by monitoring the prescription rates of drugs to specific individuals in the state and decreasing the quantity and frequency of the prescription of certain controlled substances. Prescription monitoring programs are designed to safeguard public health while supporting the legitimate use of medications that are classified under the Controlled Substances Act. They do not hinder the legitimate prescribing of a controlled substance by a physician. The electronic database is accessible by parties who are authorized under state law to receive information and the large regulatory bodies involved in the identification of controlled substances, such as the United States Drug Enforcement Administration (DEA). However, the DEA is not formally involved in the administration of any state PMP. According to several resources, including an article in the Clinical Journal of Pain, prescription monitoring programs have the support of the majority of physicians. PMPs represent a joint effort between the medical profession and law enforcement to support the appropriate use of controlled substances while regulating the potential abuse of these agents. The physicians, pharmacies, etc., that distribute controlled substances are obligated to register with their particular PMP in their state and to report the prescriptions of controlled substances to an online database. In some cases, data may be transmitted to multiple states. PMPs monitor controlled substances defined by federal statutes and specific state statutes; thus, nearly all PMPs monitor data regarding federally controlled substances through Schedules II to IV. Some states may monitor other drugs of concern. Physicians and pharmacists may obtain PMP reports for their patients, and some states may provide information to law enforcement agencies for specific investigations of drug cases, to regulatory and licensing boards for investigating healthcare professionals’ prescription practices, to state Medicaid programs, to state medical examiners to investigate causes of death, and to research organizations for research. Brandeis University offers a link to a listing of each state’s laws, regulations, and rules regarding their PMPs. States with prescription monitoring programs are outlined below. Improvements in clinical decision-making and patient care: Research has indicated that healthcare providers have been able to use the data to alter their prescribing practices, to avoid issues with patients who engage in doctor shopping, to reduce their prescribing of narcotic drugs, and to increase the confidence of physicians that when they prescribed prescription medications, they were doing so appropriately. 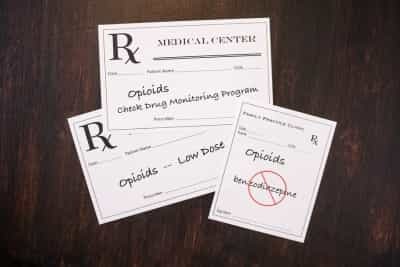 A positive impact on controlled substance availability: The implementation of PMPs has resulted in fewer prescriptions for powerful narcotic drugs (e.g., OxyContin) being written in favor of other drugs, an overall decline in the prescription of narcotic medications, and the use of medications that are less likely to be abused. Although individuals who use prescribed medications according to the instructions provided by their physician are less likely to abuse them, higher rates of prescriptions for powerful narcotic medications make these drugs more available to individuals who will abuse them. Improved health outcomes: Monitoring and tightening the prescription and availability of controlled substances is associated with overall improved health outcomes according to most of the research. Reduction of costs: According to the research, the implementation of PMPs has resulted in a significant decline in the costs associated with inappropriate prescribing of controlled substances. Reduction of diversion of specific drugs: Research has indicated that a significant reduction in the availability of potential drugs of abuse on the street has occurred for drugs like Vicodin, OxyContin, methadone, morphine etc., compared to their availability prior to the implementation of PMPs. Assistance in the treatment of substance abuse: Research has indicated that substance abuse treatment providers can benefit from consulting with PMPs when working with individuals who abuse controlled substances to get valuable information regarding the practices of these individuals. Assistance in drug abuse prevention and education programs: Research indicates that data provided by PMPs can also be used to direct the implementation of substance use disorder prevention programs and as educational tools for professionals and laypersons regarding substance abuse issues. While prescription monitoring programs have assisted in the monitoring and control of the abuse of numerous controlled substances, it is still clear that more can be done. One course of action to reduce the availability of controlled substances is providing better and more efficient instruction on issues related to pain control in medical schools (e.g., alternative methods to relying on narcotic medications), better substance abuse prevention training for students in medical school, and broadening of the scope of medications monitored by PMPs (e.g., some states still only monitor controlled substances in Schedule II-IV). Nonetheless, the implementation of PMPs has resulted in numerous positive effects in the medical and law enforcement fields to combat the serious issue of prescription drug abuse.